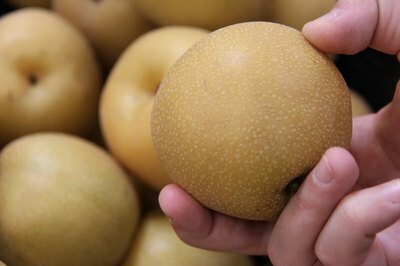 Asian pears differ from European and American pears in that they are picked ripe from the tree and don't require a secondary ripening period. There are many different varieties of Asian pears, so selecting a ripe pear based on the appearance of the skin may not work well. Once you have become familiar with a particular variety, you may learn to distinguish ripe pears of a particular variety by the color of the skin. Look at the skin. The skin of the pear should not have very many brown spots. Although Asian pears bruise easily, excessive brown spots indicate a pear that is over ripe. One or two small brown spots indicate a pear nearing over-ripeness. More than five or six, and the pear is likely over ripe or severely bruised. Feel the weight of the pear compared to others of similar size. A ripe pear will be heavy for its size. If you have two pears of similar size and one is heavier, it is likely more ripe than the lighter pear. Smell the pear. 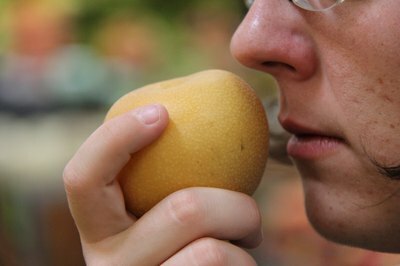 The best way to test for ripeness is to smell the pear. It should smell sweet and very fragrant. Check for a springy texture to the pear. This is something that you will pick up after eating Asian pears for a while, but the springiness of the pear should be somewhere between an American or European pear and an apple. 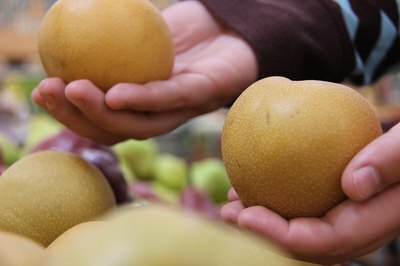 The best way to check a particular batch of pears is to ask for a sample. Market pear sellers throughout Asia offer slices of their produce. If you are buying pears in the supermarket, consider buying one and eating it outside the store to test ripeness. The pear should be sweet, crisp, fragrant and juicy. Asian pears should not be soft like American and European pears. Pick only pears that separate easily from the tree if you are choosing a pear from a tree. 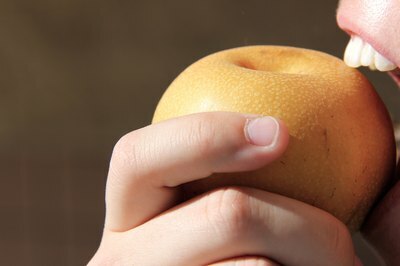 Be more careful with Asian pears than other fruit; most varieties bruise very easily.